The Scripture is equally clear: angels are humble. As it is written in Revelation 19, when John wants to worship the angel, the angel bluntly states, “You must not do that!” Angels and saints in heaven are not to be worshiped, that is, prayed to and invoked, as too many churches do to this day. I am a fellow servant with you and your brothers who hold to the testimony of Jesus. Worship God. Prayer is organically part of worship. Since an angel did not want worship and prayer from John, since only the Lord is to be so worshiped and invoked in prayer, then it would follow that the saints in heaven do not and should not be named in prayer. Yet, the saints as the angels are in the communion around the throne of the Lamb and as a whole, do pray for us, His Church, and those prayers are compared with incense ascending to the Lord, cf. Revelation 5:8,Revelation 8:3,Revelation 8:4. We are not alone: I think when popular articles about UFOs and ETs, begin with, “we are not alone”, it is strange and sad science fiction comfort that is sought: we are not alone in the vast universe. But the Lord has told us this for centuries, the millenia: we are not alone. This is God’s own truth. His angels keep us safe and watch over us, serving us frail mortals. The angels know they did not die for sinners. 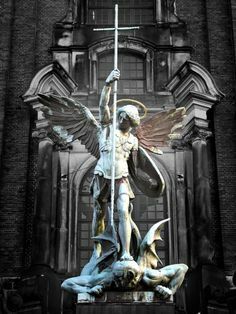 The angels saw what happened when one of their own wanted to be worshiped as God, that is, Lucifer (literally, light bearer). The angels know that God’s own Son did not die and rise for them, but for the Sons of Adam and the Daughters of Eve, who fancy themselves as ‘stars’, wanting to be “like God”, following the angel hosts’ fallen brother’s lie (see Genesis 3). Again, the name Michael means, “Who is like God?” Answer: not Michael, but the Son of Joseph, the Son of God: Jesus. The angels know they can not bring another Gospel (see Galatians 1:8), but they give witness to the Gospel of the Son’s Crucifixion and Resurrection, the “eternal Gospel”, for us all to see and come to faith, see Revelation 14:6. We are not alone, we are baptized into the Holy Communion, not by an angel from heaven, but from one of the Lord’s messengers, your pastor, in the communion of the whole Church on earth and angels and archangels and all the saints in heaven!